The Headlines got me thinking, are there no rich people on the mainland or are they saying there are no poor people living on the Island? Na wao! These headlines would give nothing away until you read the details to discover how the writers are gloating about their choice to live on the mainland as against the seemingly rich colleagues that chose the Island. I was thinking, if the decision to live on the Island is a personal rather than financial one, why should anyone celebrate the loss of another person. Consider this, before now we were all Lagosians, now because of flood, some have separated themselves and have become 'Mainlanders.' This mindset is a snippet of the larger picture. We are Nigerians but yet divided by regions, states, tribe, religion etc. Haba!!! Why are we like this? I never knew Cameroon is one of the most diversified country in the world until recently, yet their differences are not in the face of the world like Nigerians have made theirs. Cameroon, with about 24 million people, has 289 ethnic groups and 2 official languages and cultures, French and English. Compared with Nigeria of 180 million people that has about 300 ethnic groups and one official language. My worry is that the way we are going, it will only take another heavy downpour before we hear of 'Ajahites' sending sympathy texts to the 'Lekkites' or we hear of the 'Ikotans' deriding the 'Awoyayans' because their area is flooded. What is surprising to me is that instead of the disaster bringing us together, it is tearing us apart. 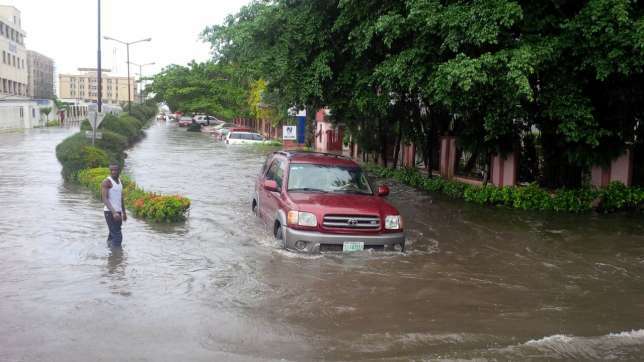 In response to some 'mainlanders' mocking those on the island after the flood, Beat FM On-Air-Personality (OAP), Gbemi Olateru-Olagbegi had fired back that it was the inferiority complex of those in the mainland that is motivating them.Hmm!!! When the audio version of these posts start coming up like podcasts, they just might go viral. The psyche of the average Nigerian nay human today is dead. If not, why should a human be happy over the misadventures of others. It goes to show that we are psychologically dead. This is why at the scenes of accident, mishap etc instead of people rendering genuine assistance, you see them taking photos and videos for the sole reason of posting it on social media. There is definitely a problem with us. I don't just know how to explain it but its definitely painful to say the least. Funny enough, we have more churches and mosques now than ever before but the humans are getting more hardened. Is it really a sign of the end time? True love, i mean agape is getting more elusive by the day and instead in its place we have jealousy, envy, avarice, greed, backstabbing just to mention but a few. May the good Lord soften our hearts and make us humane, show more empathy towards others and the world would be a better place for all to live in. Thanks Weymeg for your thought provoking write up.